June 6: The 2nd Tibet, Hong Kong, and Taiwan Round Table conference successfully concluded today in Washington,DC at George Washington University. 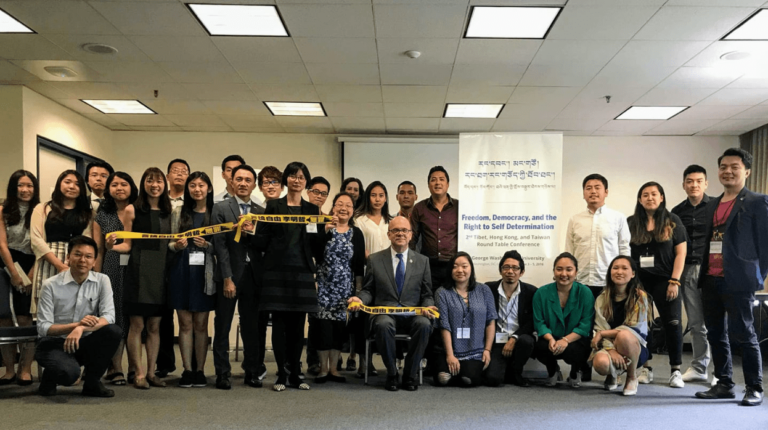 The conference brought together a select group of Tibetans, Hong Kongers, and Taiwanese frontline leaders and activists, representing thirteen key movement-based organisations and networks from Taiwan, Hong Kong, London, Switzerland, Canada and different cities from the United States. The first conference took place last year in Taipei, Taiwan. The closed-door conference was a strategic meeting to address many problems and challenges faced as a result of the increased crackdowns on voices demanding freedom, democracy, and Human Rights not just in Tibet, Hong Kong, Taiwan but across China and its occupied territories. Participants engaged in discussion and strategic planning for more coordination, cross-movement campaigning and actions that challenge the Chinese Communist Party’s mechanisms of oppression and ways to overcome them through strategic nonviolent actions. “We are here to build a strategic alliance for the people’s movement for freedom, democracy, and the right to self-determination to develop a long-term vision for a coordinated effort to safeguard the right to freedom and democracy that is threatened by the CCP regime.” said Jeffrey Ngo, a member of Hong Kong Demosisto’s Standing Committee. The Tibet, Hong Kong, and Taiwan Round Table Conference for Freedom, Democracy, and the Right to Self Determination is an annual conference organized by Students for a Free Tibet. Students for a Free Tibet (SFT) works in solidarity with the Tibetan people in their struggle for freedom and independence. We are a chapter-based network of young people and activists around the world. Through education, grassroots organizing, and nonviolent direct action, we campaign for Tibetans’ fundamental right to political freedom. Our role is to empower and train youth as leaders in the worldwide movement for social justice. SFT was founded in New York City in 1994 by a group of Tibetans and young students and supporters. Since that time, SFT has grown into an international network of students and non-students in more than 35 countries.